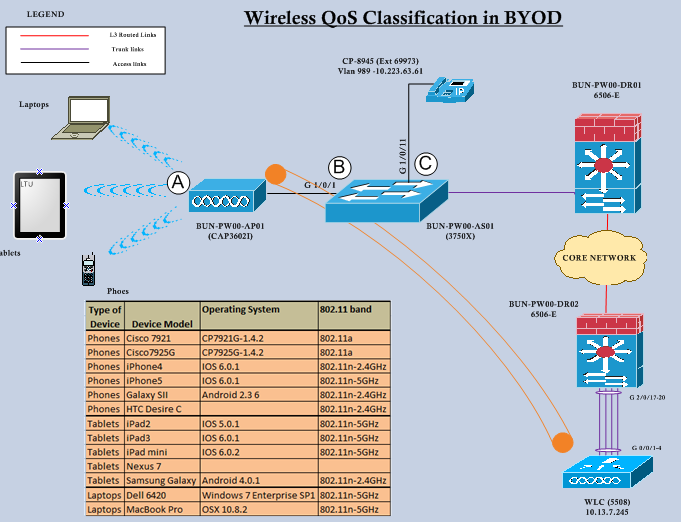 Even though this is not a CCIE wireless topic, I had to spent lot of time to test BYOD devices for its QoS capability. My company is planning to deploy Cisco Jabber on those sort of devices to provide voice services.Officially Cisco is not supporting those sort of deployment over BYOD, but most of customers keen to deploy voice/ video services through BYOD. As stated in my previous wireless QoS posts, it is purely up to end device to correctly classify traffic within the wireless media. AP does not have control how end devices tagging user priority (UP) in 802.11 frame. AP simply use this UP value in 802.11 frame to map QoS values in CAPWAP headers and subsequently this will determine how packet will get QoS treatment within wired media. If end device (BYOD) is WMM certified we would expect that to classify traffic into one of Voice, Video, Best Effort, Background classes and tag correct UP value in 802.11 frame. But in reality it will not work as we expect. Some time application developing vendors & BYOD manufacturers are not collaborative (as they are competing for same market segment). I have done extensive testing with different types of BYOD with Cisco Jabber & Polycom Real Presence client installed on it. Here is my testing topology. I have made a call from wireless device to wired phone & capture packets at 3 different location shown as “A” “B” & “C” in the diagram. I have mentioned the device type & operating system used as things heavily depend on hardware/driver platform & operating system used.Also shown the 802.11 band where the end device associated. WLAN configured with Platinum QoS profile & WMM settings as “Allowed”. Here is the result for wireless phones. You can see Cisco wireless phones mark UP value 6 for its voice traffic & UP-4 for its signalling traffic. iPhones mark voice traffic with UP value of 5 (treat as video), but signalling traffic go as UP-0. Galaxy SII mark voice traffic as UP of 4 & signalling traffic as UP of 3. If you look at Tablet devices observation is quiet different. Most of the apple devices does not correctly classify traffic with required UP value. In this case no prioritization within the wireless cell & further in wired media as well. All type of traffic go as “Best Effort” in to wired media. Noticed SIP traffic mark as CS3 in original IP header, but no UP other than “0”. As you can see behavior is different in each type of BYOD and you need to verify end to end QoS can be delivered prior to deploying voice/video services over wireless network. To overcome this issue (BYOD does not classify traffic properly) cisco has come up with traffic classification (feature called Application Visibility & Control) in 7.4 software release for WLC. In this way at least traffic can be re-classified at the WLC, so wired media will get correct QoS treatment for the different type of traffic. Still this won’t help to prioritize upstream traffic from wireless client to Access point. That’s why you should select appropriate BYOD models to deliver voice/video services over wireless. I Will write another post on AVC feature in this WLC 7.4 code. Thx Rasika for such important information … So is there no way to prioritize traffic from wireless client (laptop in my case) to AP …. if i explain the issue in a broad way there is no congestion going on in wired network. When multiple users connect to real presence and all share the same AP. they get real-time output over the call BUT if someone start file-transfer over the same AP the real presence call voice/video get stuck. I applied the AVC feature on WLC but as i tested and per your post i think prioritization from my laptop to AP will not happen and the situation remains same. Please share if there is any way to prioritize traffic from wireless client (Laptop) to AP only ? Yes, from wireless client to AP it is purely determine by WMM_UP value of the wireless frame which is determine by both application/wifi driver of your client. AVC happens at WLC level & therefore it won’t help to classify wireless client traffic until it gets to WLC in upstream direction. 1. In this scenario does user traffic really flow like .. Laptop > AP > WLC > destination ?? 2. laptop sent frame to its gateway IP when it reaches to AP it CAPWAP encapsulate Source=AP’s IP and Destination=WLC IP then WLC receives frame and look for the actual destination and then send it to Laptop’s gateway IP ? 3. or i think WLC only push the policies and control to AP but user traffic flow like – laptop > AP > (layer3 gateway / gateway defined on laptop) > routing lookup by core router >destination. Which one is correct behavior ? AVC doesn’t push policies to wireless client ..that is fine and i agree that until client end application / tool or wireless diver doesn’t classify traffic appropriately AP would not get correct marking..
After reading your last post on cisco forum it looks like the 2nd point is explaining correctly (in my above post)..
As you understand correctly, in the current CUWN context ALL traffic has to go through the wireless controller (kind of a drawback). That’s why in Converged Access (like 3850/3650 switch model) WLC functionality distributed to the access switch level. Please read “Understanding Wireless QoS – Part 1-5 ” series in my blog you will get a clear understanding of traffic flow & QoS. Regarding AVC, for upstream traffic it does not take any effect until traffic hits WLC (NOT at the AP level even if we think that should be the case). So AVC’s capability is very little on that direction traffic.